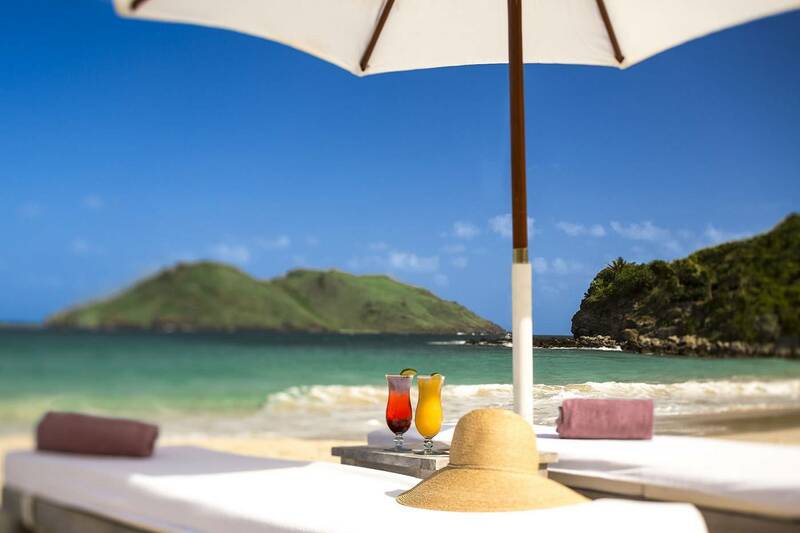 Situated on the classically Caribbean Flamands Beach, this stunning 5 star property is a Maison in the prestigious Cheval Blanc portfolio, and epitomizes the island’s signature brand of casual sophistication. It is the proud recipient of the prestigious "Distinction Palace" designation. Bestowed by the French Ministry of Tourism, this honor recognizes a standard of excellence that enhances France’s image throughout the world. 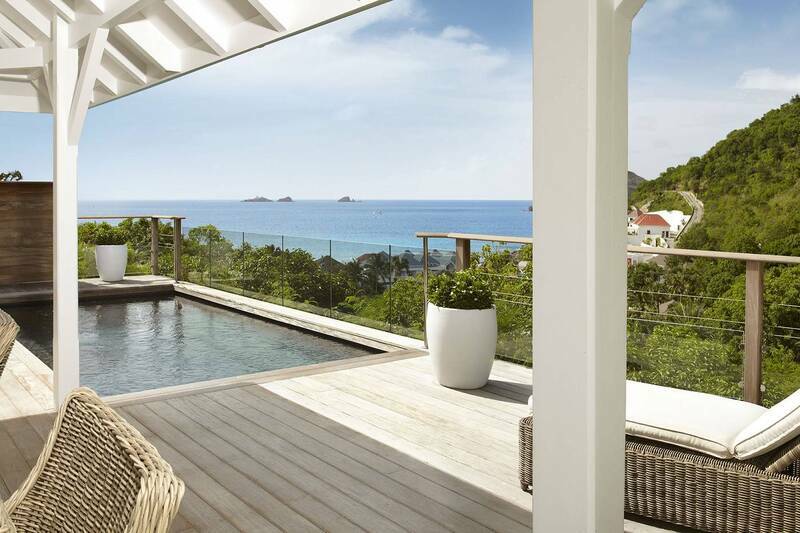 Cheval Blanc St-Barth Isle De France is the only hotel in the region that holds this distinction. Guests enjoy all it offers including the ocean side swimming pool, and a spa offering heady rituals and signature treatments by Guerlain. A fitness center is outfitted with the latest Technogym equipment. Note: The hotel will be closed May 31, 2019 for further exciting renovations. It will reopen in the fall of 2019 with 19 new rooms and suites, bringing the total number to 61. 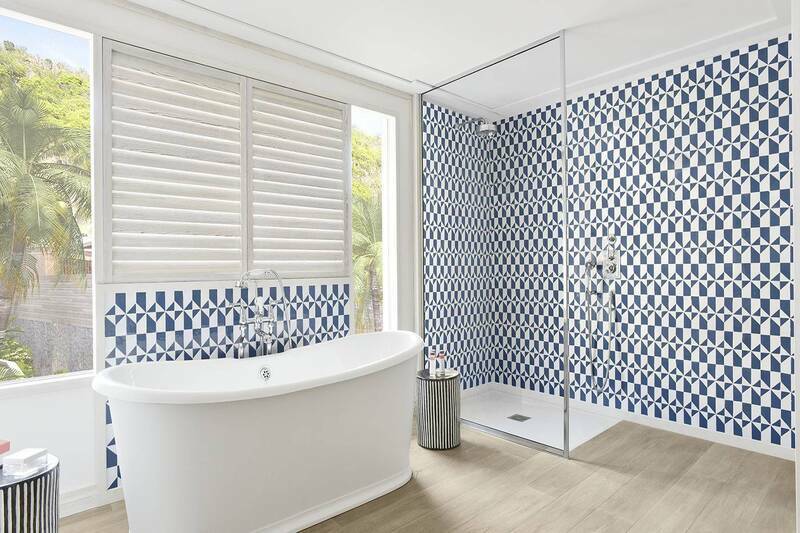 French designer Jacques Grange, with his contemporary vision that embraces vibrant patterns, rattan furniture, warm woods and airy cotton will continue his handiwork. 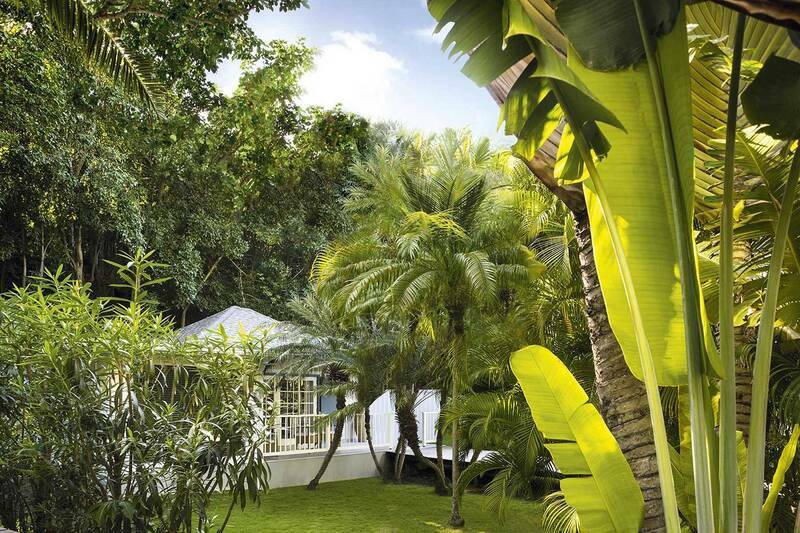 Renowned landscaper Madison Cox will enhance the lush tropical gardens adding to the ambiance. Honeymooners will continue to love the romantic Garden Bungalows and families can settle in the 2 bedroom suites. The fall of 2019 will also see the reopening of a new boutique featuring in-vogue resort wear, a beach front, casual restaurant . and Le Carrousel, a special area for playing and enjoying activities and well-crafted experiences. Parents love it too! The tradition of the Tuesday evening fashion shows at the poolside White Bar will continue and the Champagne is always chilled. 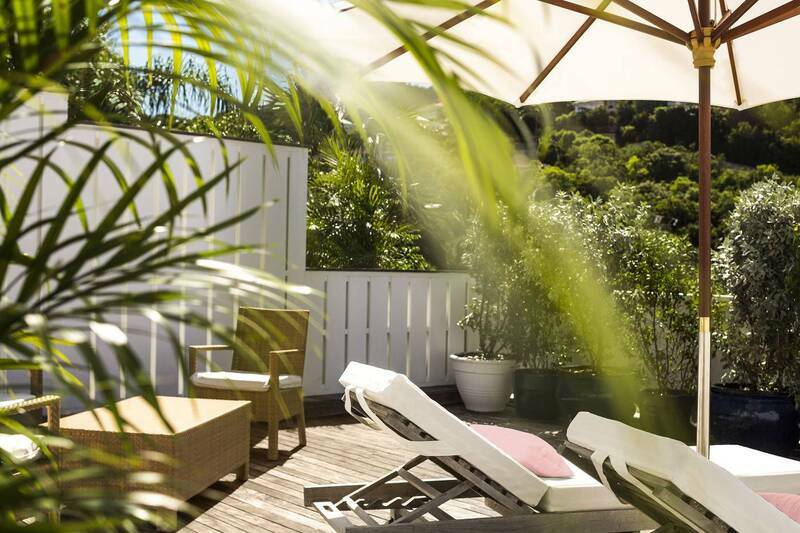 The Tropical Room is located on a hillside overlooking the lush tropical gardens of the Maison. 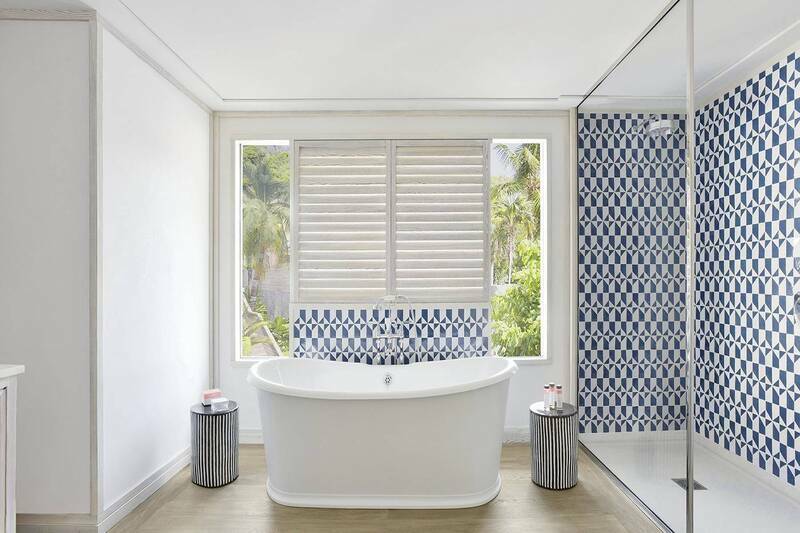 Bathed in soft light, this large room of 60 sq m (645 sq ft) features a bathroom equipped with a rain shower as well as a private terrace–a quiet hideaway for relaxing escape in a Caribbean ambiance. A king-size bed or twin beds are available upon request. Nightly rates are upon request and vary by dates and demand. Rate includes daily breakfast, ground transfers from airport or harbour and excludes 5% local tax. 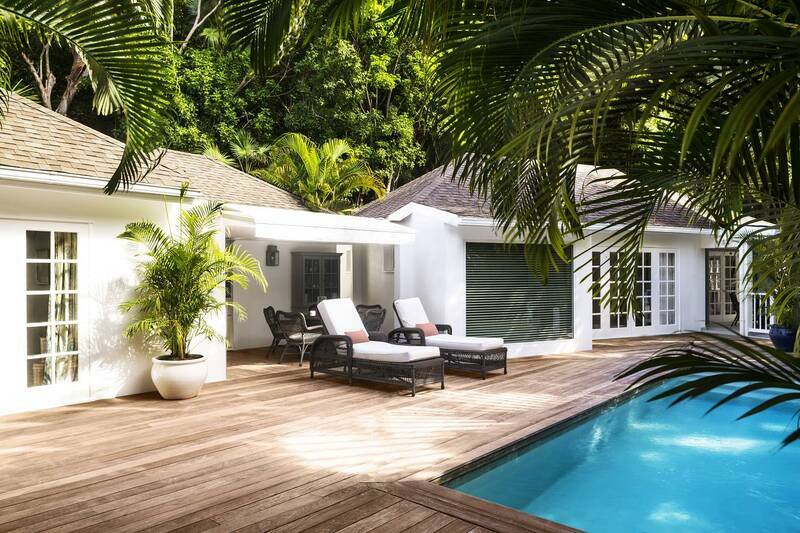 Located in the heart of the Maison’s gardens, the Garden Bungalow offers a serene retreat. With a surface of 65 m2 (700 sq ft), it features a grand bedroom, a bathroom equipped with a bathtub and rain shower, and a quiet terrace perfect for island repose. A king-size bed or twin beds are available upon request. 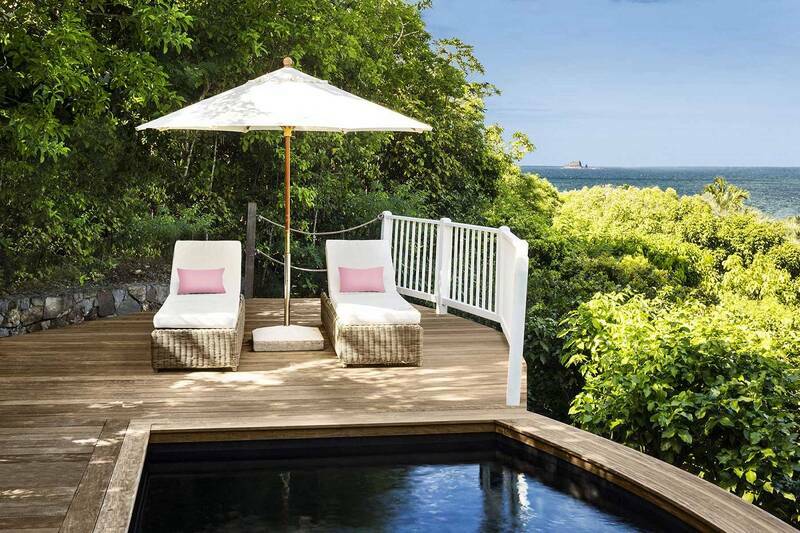 Perched on the peak of the island’s hills overlooking the Maison, the Hillside Bungalow offers a panoramic view of the Caribbean Sea. 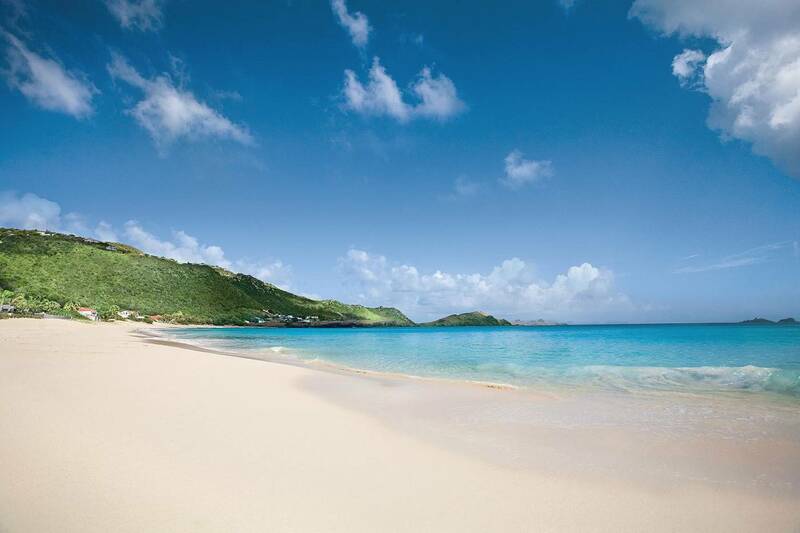 Flamands Beach is only a five-minute stroll from the bungalow, down a 60-step walkway through the tropical gardens. The 65 sqm (700 sq ft) room hosts a large bathroom equipped with a bathtub and rain shower. The terrace features an al-fresco kitchenette, lounge area and a private pool offering sumptuous views over the turquoise horizon. 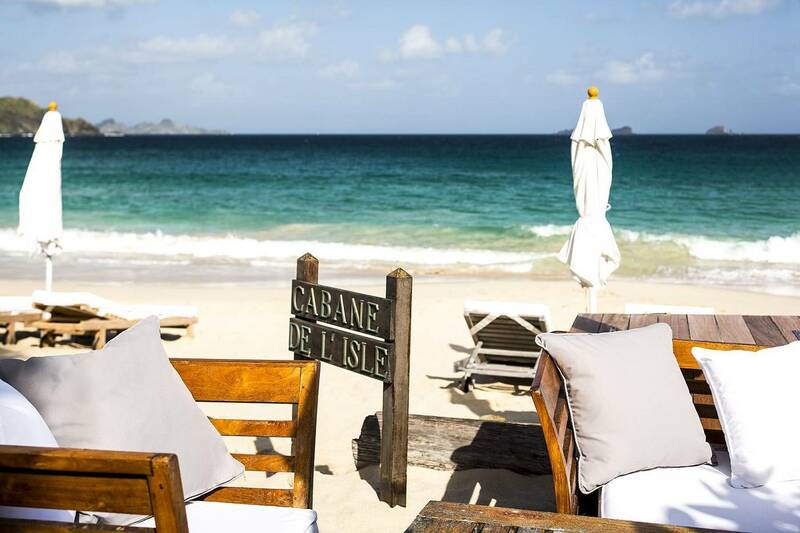 Due to its tranquil location on the hillside, all meals are exclusively served at La Case de l’Isle and La Cabane de l’Isle. A king-size bed or twin beds are available upon request. Ideal for couples, the intimate Garden Suite is a haven of tranquillity set in the midst of the gardens. This 70 sqm (755 sq ft) suite boasts a sun-filled bedroom, a bathroom with a bathtub and rain shower, and a lounge opening out onto a sublime terrace with a private pool and outdoor kitchenette. A king-size bed or twin beds are available upon request. Designed with Jacques Grange’s contemporary and discerning vision, the Tropical Suite is located in the heart of the Maison, close to the main swimming pool. The French designer is using a collection of vibrant patterns, rattan furniture, warm woods and airy cotton reflected in hues of bright and fresh tones. This unique suite of 75 m2 (805 sq ft) offers a large sitting area, a bathroom equipped with a bathtub and a private outdoor terrace outfitted with sun loungers – the perfect cocoon to indulge in absolute tranquillity. A king-size bed or twin beds are available upon request. 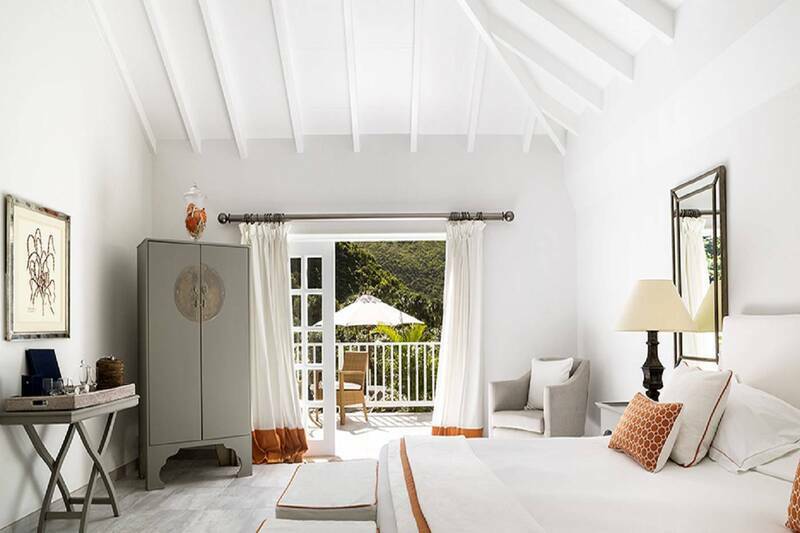 Perched on the hills or nestled in the heart of the Maison near one of the two swimming pools, the Ocean Room offers unique sea views for pure Caribbean indulgence. 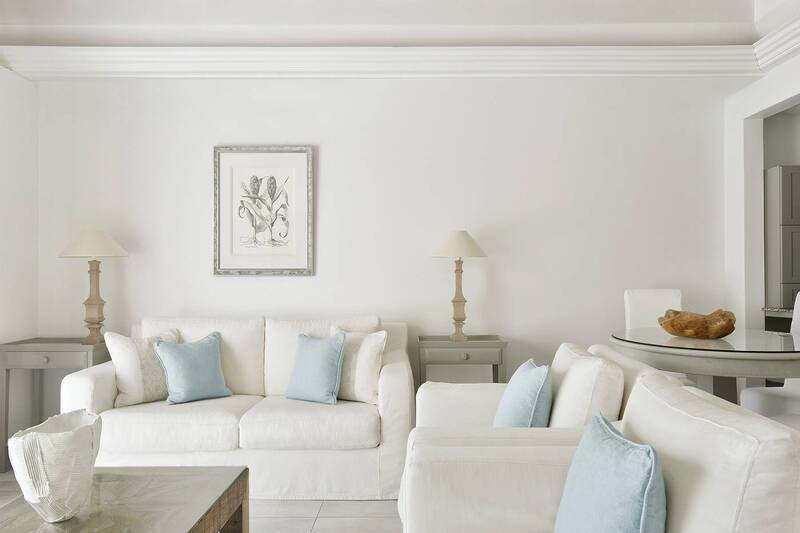 Designed by Jacques Grange, the Ocean Room evokes an elegant, contemporary ambience in a palette of blue and cream. Ideal for couples, this large 60 sqm (645 sq ft) room features a bathroom with a bathtub and a rain shower, a separate dressing room, an outdoor living-room and a breezy terrace for moments of tropical relaxation in front of the stunning panorama. A king-size bed or twin beds are available upon request. 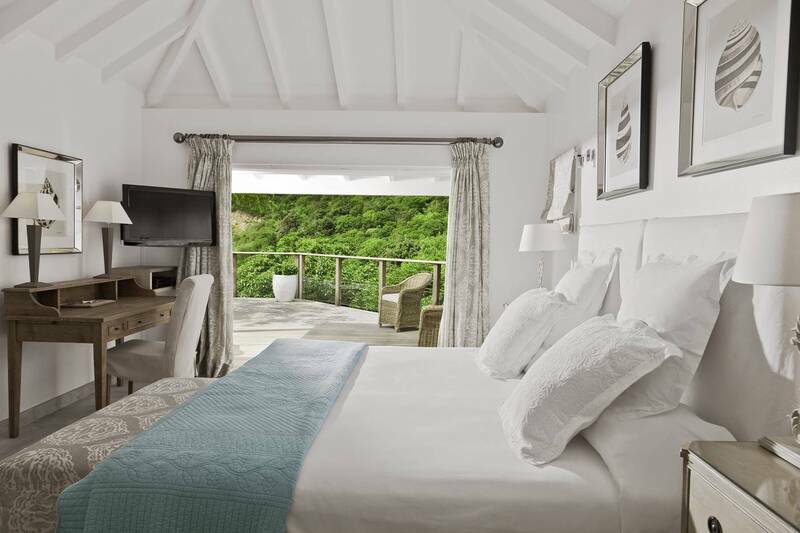 Located on the island’s hills or in the heart of the Maison, close to one of the two swimming pools, the Ocean Junior Suite offers breathtaking views of the Caribbean Sea. 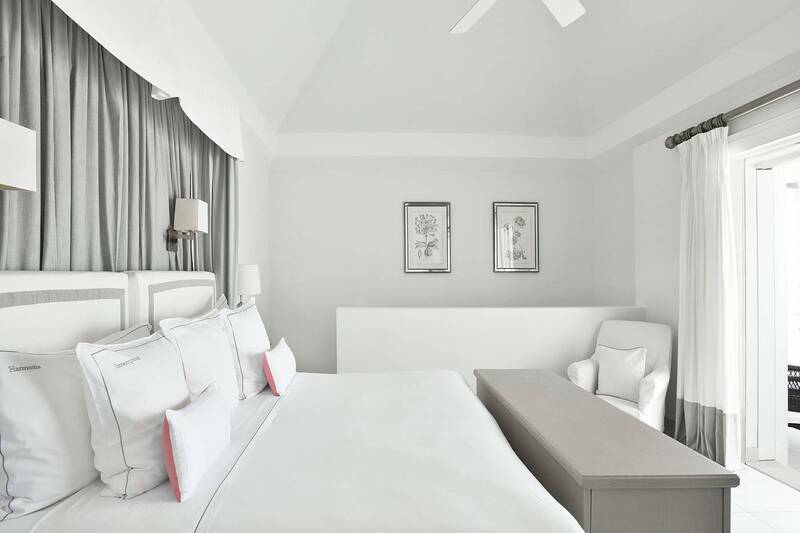 Bathed in the light of the Caribbean sun, this 70 sqm (755 sq ft) suite hosts a generous bedroom, a separate dressing room and a spacious bathroom equipped with a bathtub and rain shower. Ideal for couples, the bedroom is complemented by a grand living room and a terrace with unparalleled views of the turquoise water. 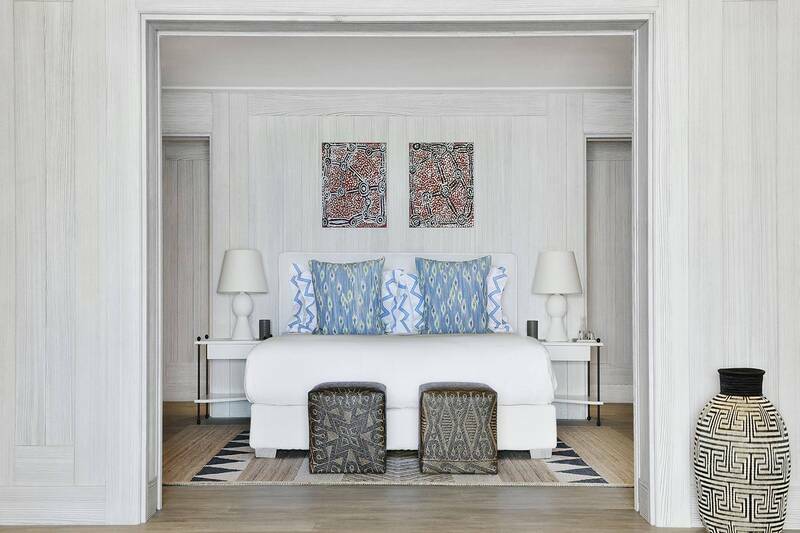 The Ocean Junior Suite has been entirely designed with Jacques Grange’s contemporary and discerning vision, using a collection of vibrant patterns, rattan furniture, warm woods and airy cotton reflected in hues of bright and fresh tones. 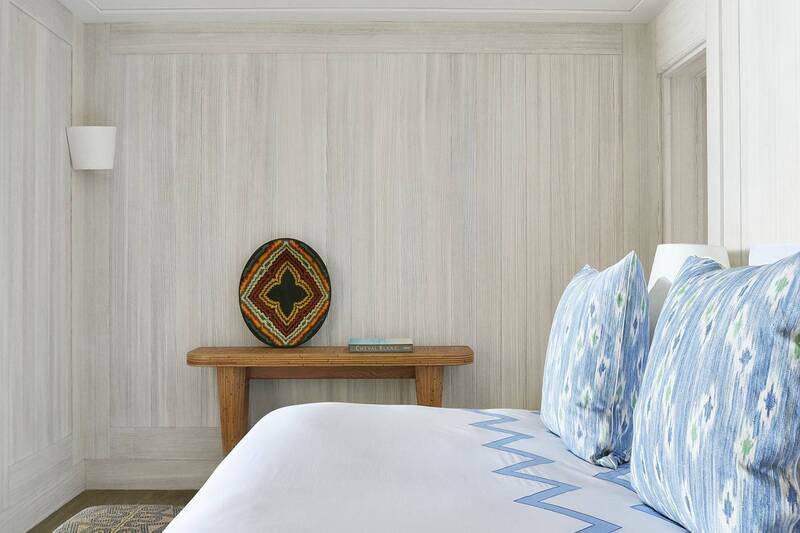 The Ocean Junior Suite offers a king-size bed. 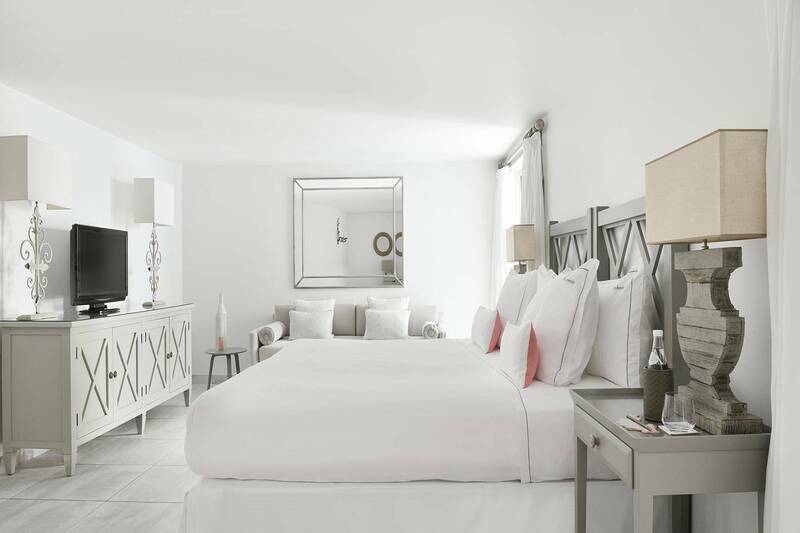 Located close to the heart of the Maison, the 2-Bedroom Tropical Suite hosts two charming bedrooms and is particularly welcoming for friends and families. The two bedrooms feature spacious ensuite bathrooms, one with a bathtub and rain shower, the other with a rain shower only. An ideal sanctuary celebrating island life, this lovely 110 m2 (1,180 sq ft) suite also offers a living room, dining area and outdoor lounge areas. Both bedrooms can accommodate either a king-size bed or twin beds upon request. 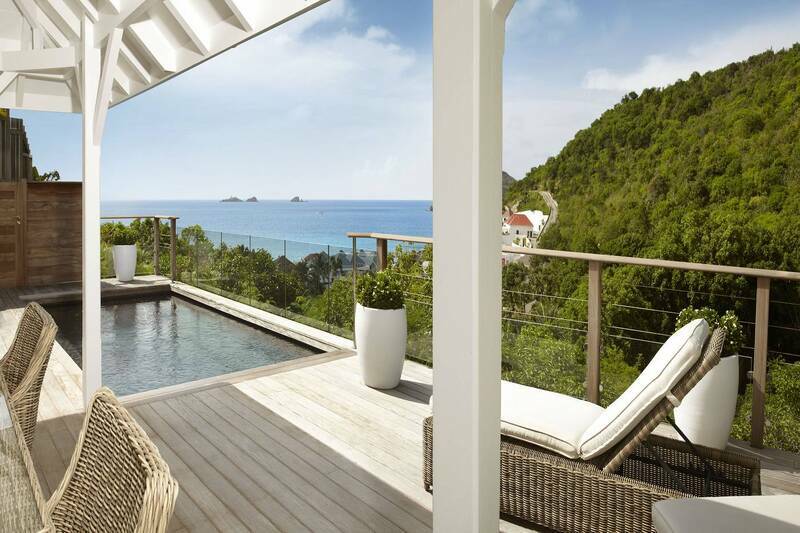 Perched on the peak of the hills overlooking the Maison, the Ocean Suite boasts spectacular views of the Caribbean Sea. 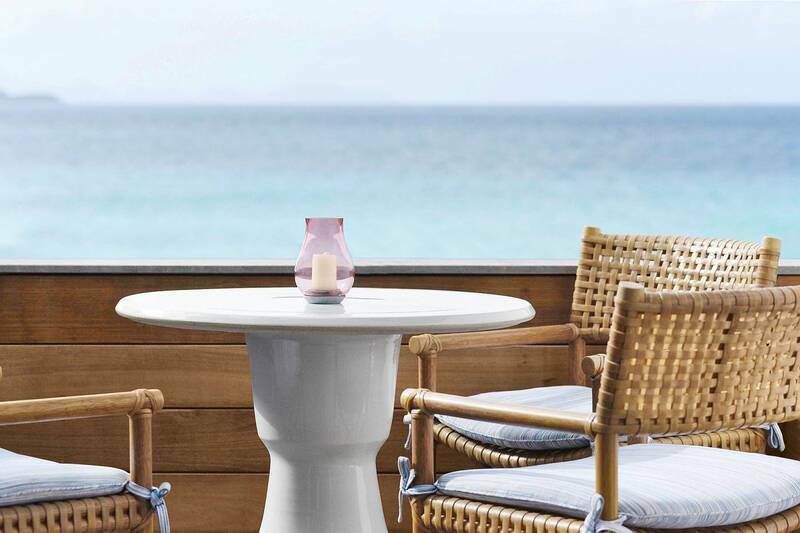 Inspired by the colours of the panoramic scenery, the spirit of the Ocean Suite is reflected in hues of bright and fresh tones, enhanced by contemporary notes from designer Jacques Grange for a true Caribbean experience. 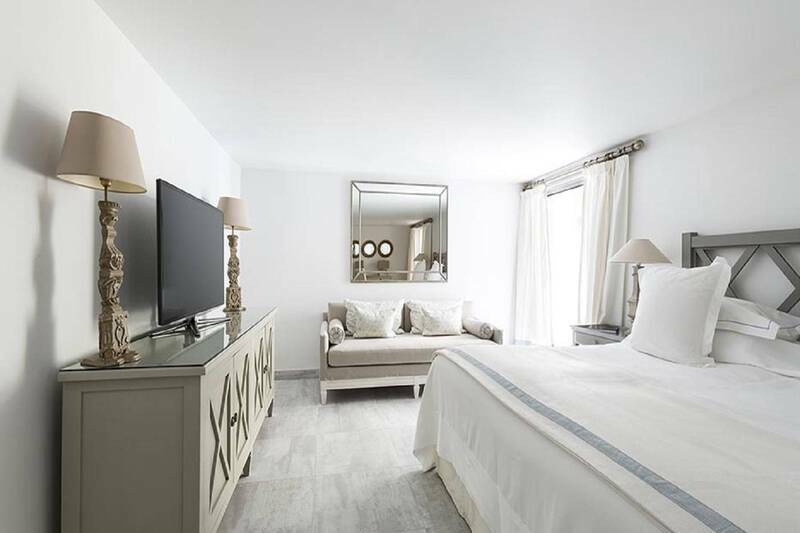 This 90 sqm (970 sq ft) suite offers a generous sun-basked bedroom, a large separate dressing room and an en suite bathroom equipped with a bathtub and rain shower. Ideal for those seeking exclusive privacy, the room extends to a spacious living room and a private terrace with sun loungers facing the ocean. A king-size bed or twin beds are available upon request. 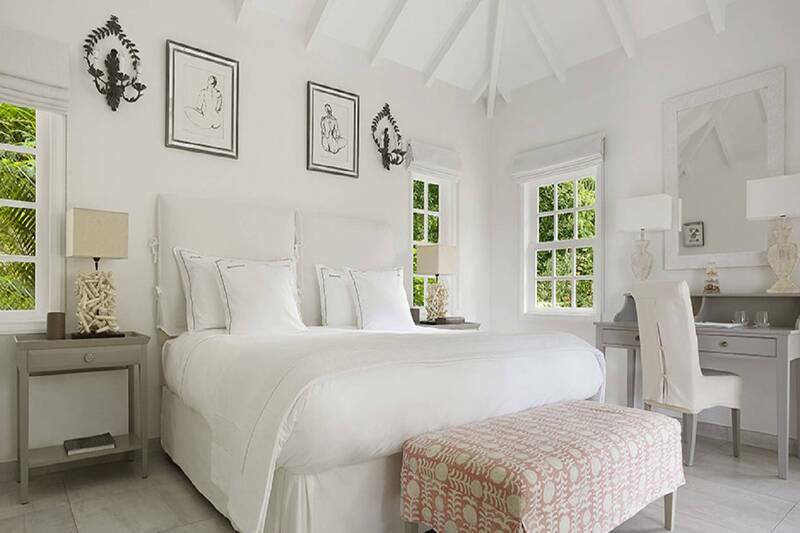 Located in the Maison’s tropical gardens, the 2-Bedroom Garden Suite offers a peaceful setting, perfect to unwind. The two bedrooms each have their own ensuite bathrooms with a bathtub and rain shower. The main suite boasts a large living room opening out to the charming al-fresco terrace. Offering a private pool with sun loungers and an outdoor dining area with kitchenette, the exteriors invite to moments of tropical relaxation. This 150 sqm (1,615 sq ft) suite is particularly welcoming for friends and families. The master bedroom offers a king-size bed, the second bedroom can accommodate either a king-size bed or twin beds upon request. 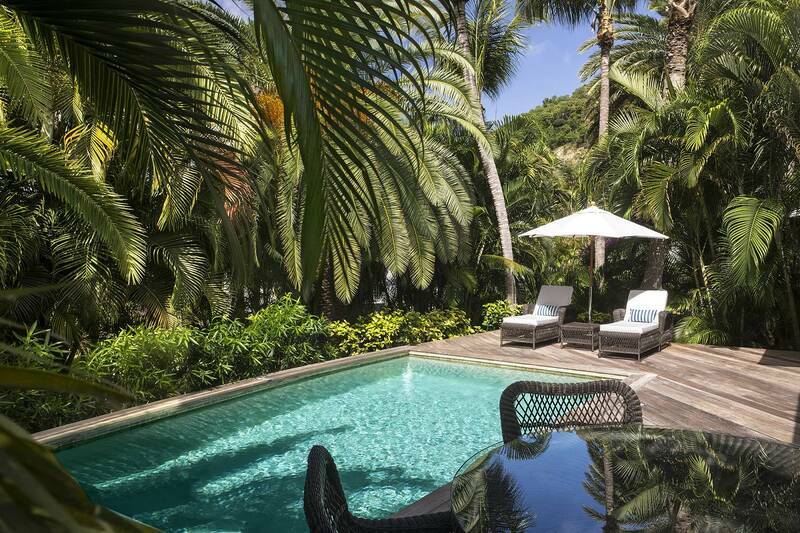 Located on top of the verdant hillsides overlooking the Maison, nestled in the lush vegetation, this 120 sqm (1,300 sq ft) villa offers a unique residential appeal with breathtaking views over the Caribbean Sea. The two grand bedrooms host bright bathrooms, one with a bathtub and rain shower, the other with a rain shower only. Facing this spectacular panorama, the generous al-fresco living room opens onto a large terrace accommodating a private pool, full dining table and open-air kitchen, perfect to enjoy the island sun amongst friends and family. Only five minutes away from the beach, the villa is accessible by a private path of 120 picturesque steps through the hillside greenery or by road. For guests’ convenience, a parking space is available at the entrance. Due to its location on the hillside, all meals are exclusively served at La Case de l’Isle and La Cabane de l’Isle. The master bedroom offers a king-size bed, the second bedroom can accommodate either a king-size bed or twin beds upon request. 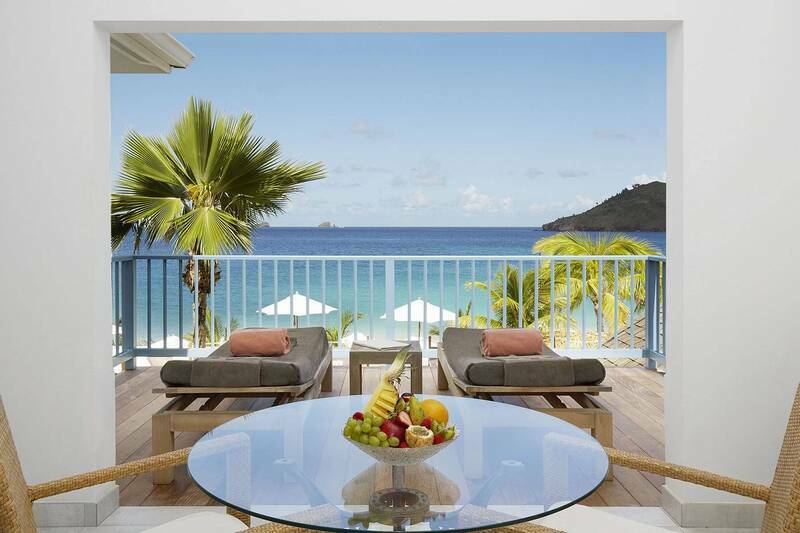 Located on the hills overlooking the Maison, the 2-Bedroom Ocean Suite unveils incredible views of the turquoise horizon. 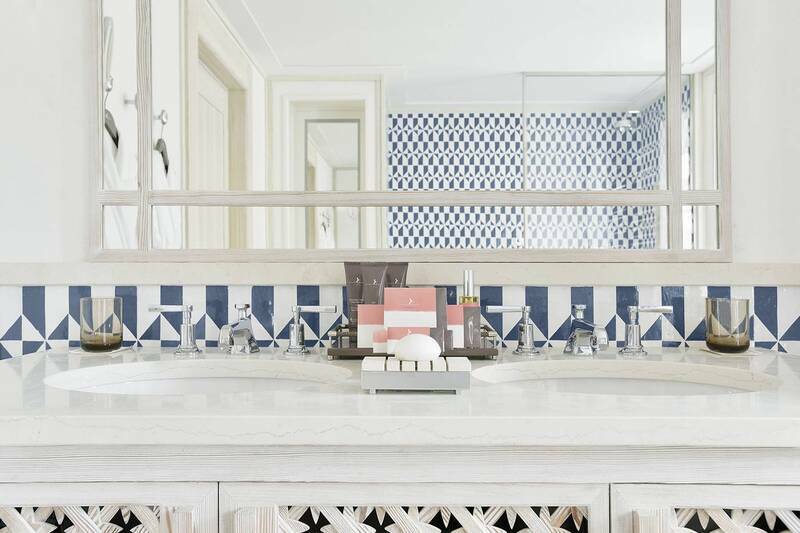 With a spectacular sense of place and unveiling exquisite island elegance, French designer Jacques Grange has brought his refined touch to this grand suite by using an enveloping palette of blue and cream. This 160 sqm (1,720 sq ft) grand suite hosts two bedrooms, both with ensuite bathrooms including a bathtub and rain shower and large separate dressing rooms. Facing the glowing panorama, this hillside jewel is completed by a spacious living room opening onto a large airy terrace with sun loungers and an al-fresco living room with full ocean views. This suite is particularly welcoming for friends and families. Both bedrooms can accommodate either a king-size bed or twin beds upon request. Directly located on Flamands Beach, this sprawling 120 sqm (1,300 sq ft) suite offers spectacular views of the turquoise water. The Beach Suite boasts a charming bedroom with a grand separate dressing room and an ensuite bathroom with a bathtub and rain shower. 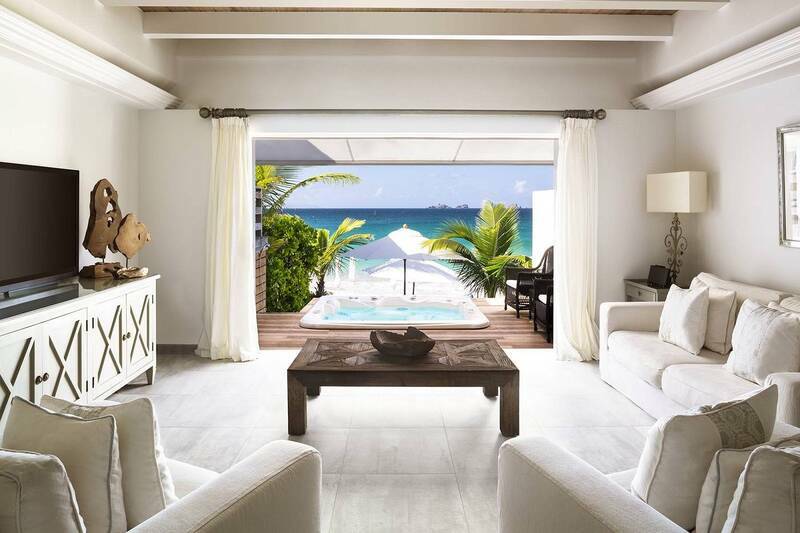 Multiple relaxation areas include a living room opening out onto a large terrace with sun loungers and a private infinity plunge pool overlooking the beach. The Beach Suite also includes the dedicated services of a Majordome, attending to guests’ every need and desire. This suite has been entirely redesigned with Jacques Grange’s contemporary and discerning vision, using a collection of vibrant patterns, rattan furniture, warm woods and airy cotton reflected in hues of bright and fresh tones. 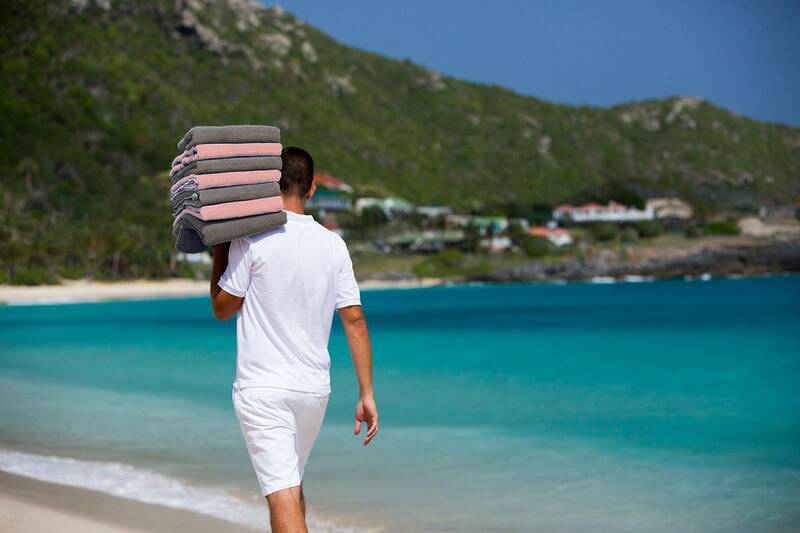 Inspired by the colours of the panoramic scenery, the spirit of the Beach Suite provides a true Caribbean experience. A king-size bed or twin beds are available upon request. Directly located on Flamands Beach, this 160 sqm (1,720 sq ft) suite is the perfect venue for a feet-in-the-sand experience amongst friends and family. 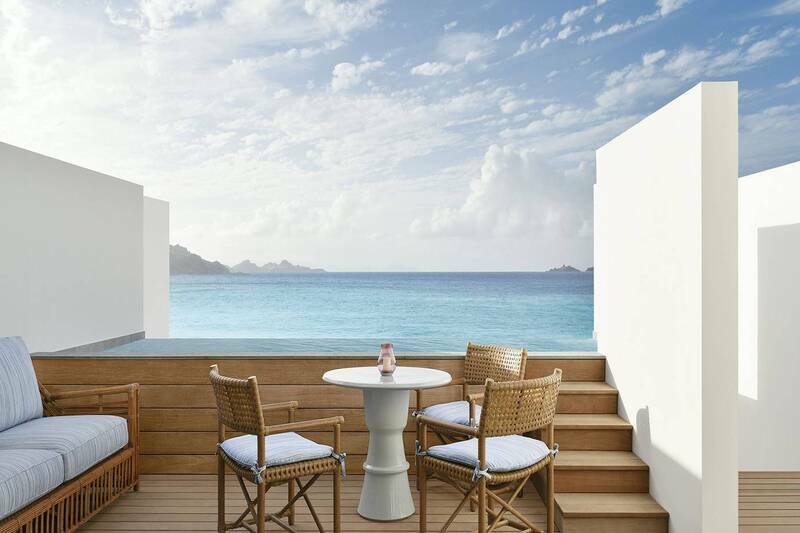 The 2-Bedroom Beach Suite opens onto its own private terraces, multiple indoor and outdoor lounge areas, and a private pool or hot tub overlooking the bay. 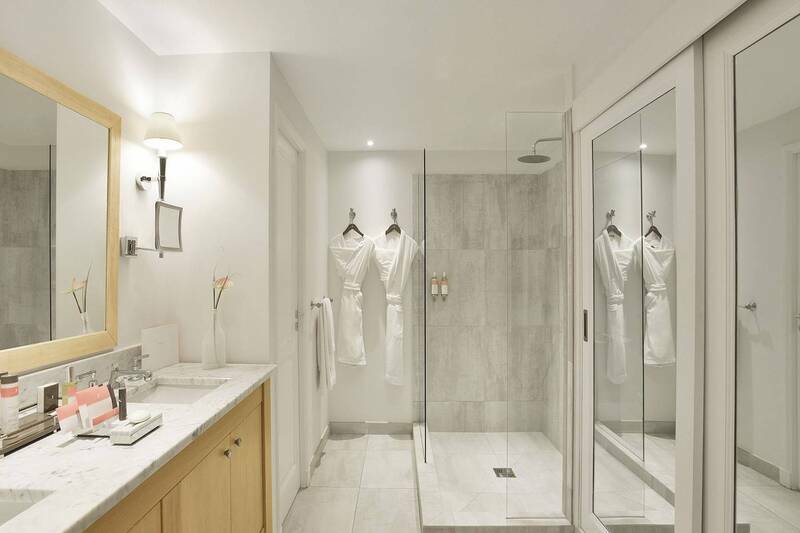 The two master bedrooms each have their own ensuite bathrooms with a bathtub and rain shower and large separate dressing rooms. 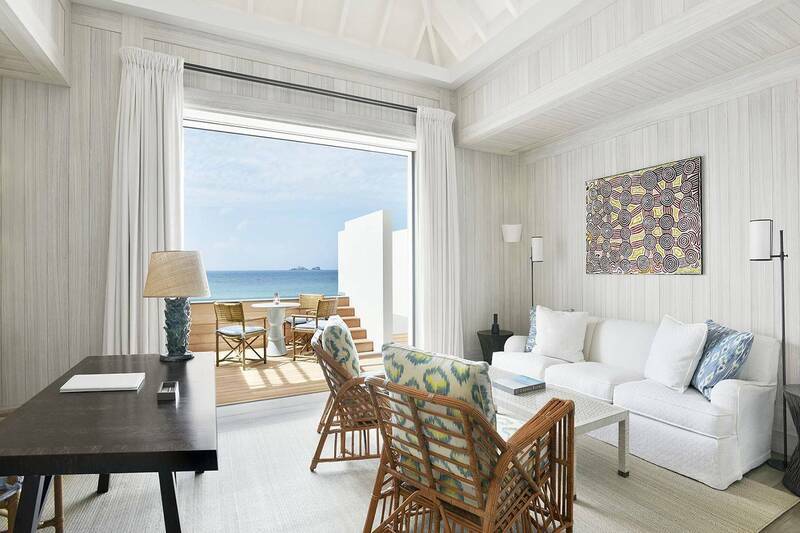 Bathed in tropical light, the suite also accommodates a living room and a dining area opening onto a terrace with direct access to the beach. 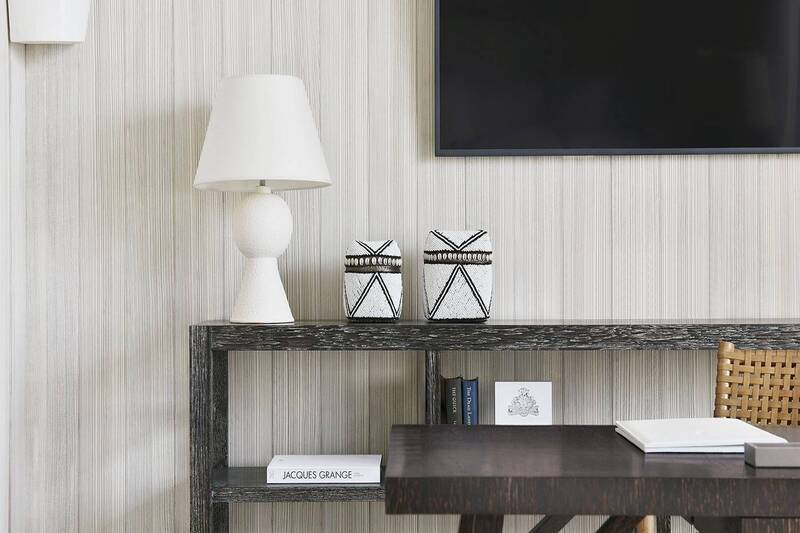 This exclusive suite is particularly welcoming for friends and families seeking an unparalleled level of privacy. The 2-Bedroom Beach Suite also includes the dedicated services of a Majordome, attending to guests’ every need and desire. Both bedrooms can accommodate either a king-size bed or twin beds upon request. 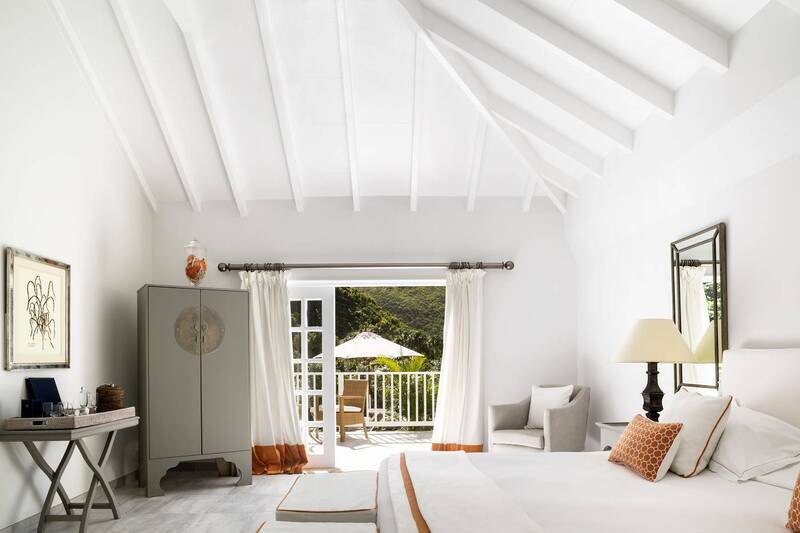 Designed by Jacques Grange and located on the hills overlooking the Maison, the 3-Bedroom Ocean Suite boasts magnificent views of the Caribbean Sea in tones of bright beige and blue. Jacques Grange’s project is inspired by the island gentle rhythm of life. A reminiscence of a lifetime of travel and his collector’s soul, colours, textures and delightful touches are orchestrated in vivid harmony to celebrate the spirit of the Caribbean Maison. This 190 sqm (2,045 sq ft) suite consists of three lavish master bedrooms with their own ensuite bathrooms including a bathtub and rain shower and large separate dressing rooms. Facing the crystal waters of Flamands Bay, a spacious living room with a grand terrace outfitted with sun loungers and an al-fresco dining room crown this remarkable residence. This unique suite is particularly welcoming for friends and families seeking an unparalleled level of privacy. The 3-Bedroom Ocean Suite also includes the dedicated services of a Majordome, attending to guests’ every need and desire. A king-size bed or twin beds are available in all bedrooms upon request. 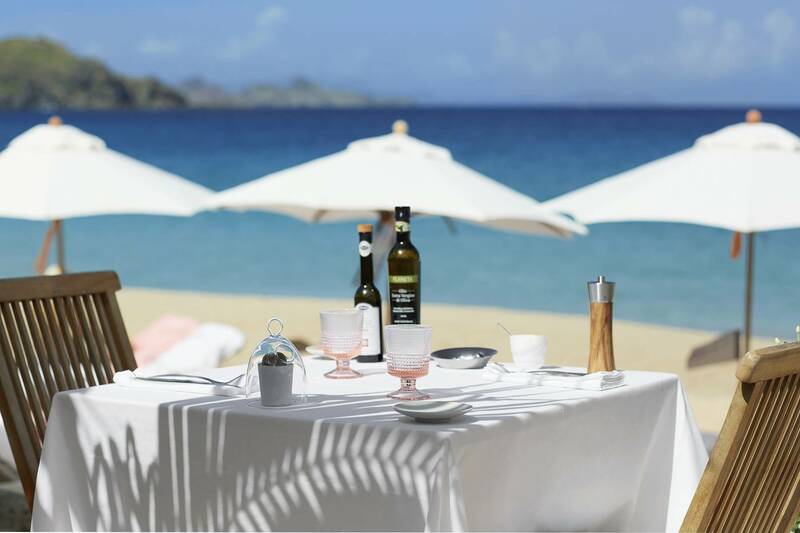 La Case de L’Isle serves a sophisticated menu with a Riviera theme: the very finest ingredients carefully selected by the chef for a delicate and gourmet cuisine. 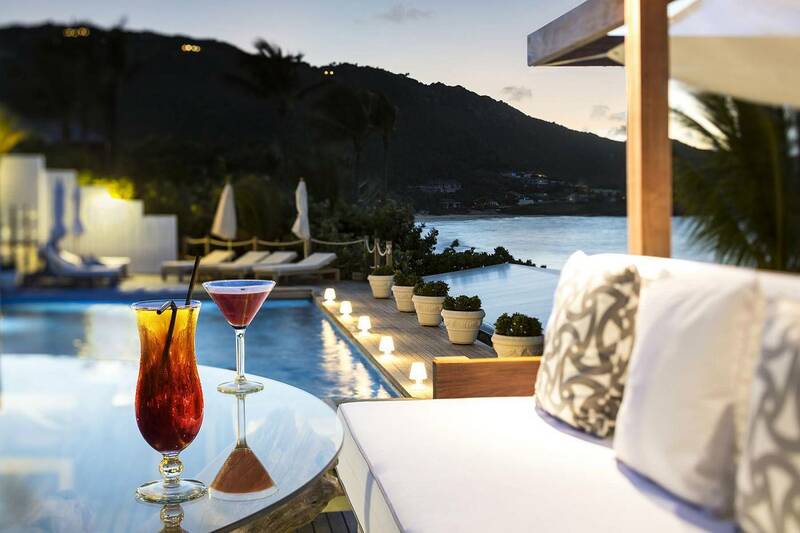 White Bar – This delightful poolside bar offers lighter fare. * All off-site activities are an additional charge. • The Boutique features a selection of a selection of local and international designers as well as prestigious brands such as Pucci. Every lunch at La Case de L’Isle and every Tuesday evening at the White Bar, an elegant fashion show unveils the latest trends in a relaxed festive atmosphere.